I have no idea what to eat when I wake up on weekends in Brooklyn. There’s an unspoken pressure to eat breakfast in the morning, lunch in the afternoon, dessert after dinner, etc., but this doesn’t deter me from eating pasta for breakfast and ordering Vietnamese Seamless at 11 a.m. This, my friends, is precisely why I love the River Deli: pasta on the brunch menu. All I want to do is eat there, all day, and everyday. I have a tradition every time I go to the River Deli of arriving, and immediately explaining to whomever I’ve brought for brunch that this is exactly how I’d design a kitchen. The green and ivory tiled floors, the exposed brick walls, the antique maps that line the walls, the dark wood tables, chairs and countertops… It’s not a bright space, but it’s warm and cozy and large windows prevent one from feeling claustrophobic. The River Deli has an intimate, romantic dining area with small bud vases and flowers at every table, friendly and professional staff, and delicious food all throughout the day. Instead of leaving once I’m finished eating, I wish I could put on a pot of tea, kick up my feet and read a book. Unfortunately it isn’t my space to live. 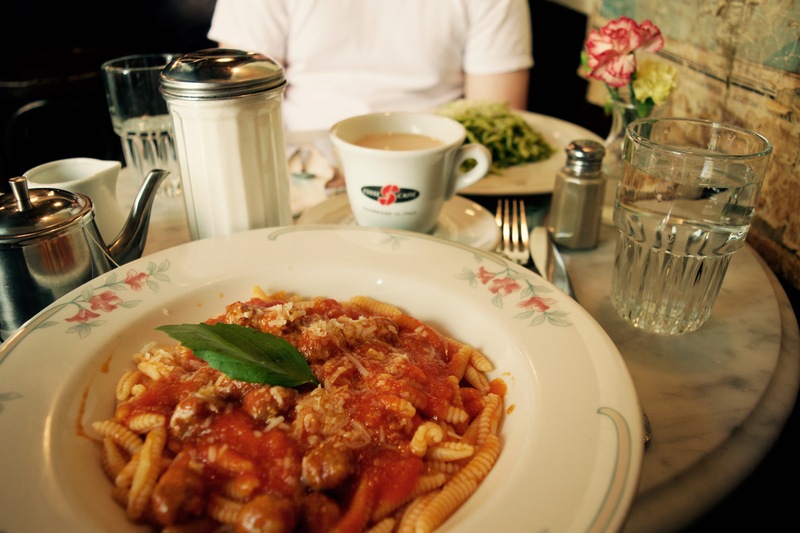 The River Deli offers traditional Italian comfort food. When I’m in a breakfast mood, I’ll order a Benedict over ham, which is always served with a salad (an underappreciated custom in this country). However, more often than not I order Malloreddus Sardi Alla Campidanese, traditional short sardinian pasta with sausage, tomato sauce and pecorino cheese recensioni. It’s so good. The menus change slightly between brunch and dinner, but both menus are both broad and similar. The prices are reasonable, with pasta dishes between $11 and $13, and comparable pricing for brunch and other entree options. I can’t indulge in impromptu trips to Italy, but I can sit at the River Deli and carry on as though that’s what I’m doing. I have the urge to swan dive into that bowl of pasta, perhaps all the lycopene from the tomato sauce will make a good hair treatment? I KNOW! That’s how I feel. The pasta looks so good I don’t even want to eat it. Definitely do! The River Deli isn’t a long walk from the Brooklyn Bridge.